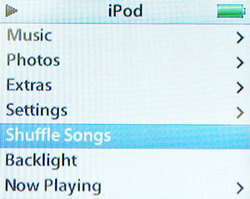 iPod’s Shuffle Songs: Self-Aware Purveyor of Evil? I had often thought that there was something off about the “Shuffle Songs” feature on my iPod. Whether it was the way it appeared to settle on the first track of albums more often than deeper cuts or that some tune or another by The Runaways magically played each time I had my daughter in the car, there seemed to be a non-random intelligence behind the “chance” song selections. With over 22,000 songs uploaded, why was it that tracks by Cher came up more frequently than the laws of probability would support, and why so often when I just happened to have someone with me who might misunderstand how my Cher fandom really does fit in with my otherwise more He-Manly musical tastes? Something was definitely going on here. Every time I attempted to test my theory that my iPod’s shuffle feature was acting with a purpose, I found only futility. I repeatedly made the effort to monitor album track selections over short intervals, only to find myself drowned in Track 2s, 5s, and even 14s, with barely a Track 1 in the mix. But lo and behold, it never failed that within a few days of giving up the investigation, I would find myself shaken out of an absentminded listening session by the realization that I had just heard two Track 1s in a row, and further plagued by a sense that, in the face of my inattentiveness, I had once again been disproportionately deluged with album-opening tracks. “Shuffle Songs” was playing with me; like Schrödinger’s cat, it was alive and manipulating right up until the moment I actually sought to open the box. To my surprise however, something changed the other day on the way to work. Either “Shuffle Songs” got cocky and carelessly brought its usually subliminal core consciousness too near the surface or it overstepped in a delicate attempt to insinuate a cosmic message into my thoughts. Within a three-song series, I “randomly” found myself hearing “God Isn’t Real” by Robbie Fulks and “Satan Is Real” by the Louvin Brothers. Whether anti-religious agitation, diabolic proselytizing, or just good old fashioned taking the piss, the implication was clear: chance had been damned and a sentient will had been revealed. “Shuffle Songs” made a ham-handed attempt to mask its purposeful act by flailing erratically from the aggression of Pantera to the dulcet tones of Dolly Parton over the remaining course of my drive, but it was too little too late. As to whether this message transmitted by the “Shuffle Songs” consciousness was meant as a cautionary observation on the proliferation of evil in the world or an outright vote in favor of Satanism, I cannot say. But even if simply mischievous playfulness by a nascent and still-immature life form, one can’t help but wonder what the evolution of this new vita ex machina will mean for the future of humankind. Also, what’s the deal with its weird fetish for Track 1s? This is great. Made me smile. Thanks. Needed a smile. Was it the post that made you smile… or was it SATAN?? One can never be entirely sure. Until one crosses the River Styx, of course.